» A New Bill & Ted Movie Is Actually Happening! Maybe! 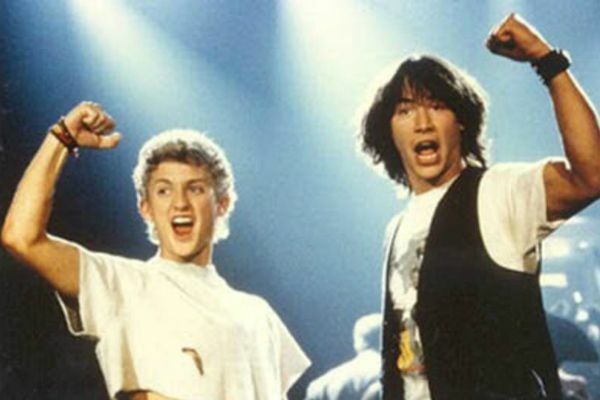 A New Bill & Ted Movie Is Actually Happening! Maybe! Vulture reports that the long-rumored third Bill & Ted movie is — hope against hope! — actually moving toward fruition. Ed Solomon and Chris Matheson, the guys who did Bill & Ted’s Excellent Adventure and Bill & Ted’s Bogus Journey, have written the script for the third movie on spec. As Vulture explains, they wanted to go ahead and bang out a screenplay before they had a deal in place so that they could “ensure a take that would address where Mssrs. Ted Theodore Logan and Bill S. Preston, Esq. are in their lives today as opposed to being a reboot or remake.” So the duo is now shopping it around to studios for financing; MGM still owns the rights, but the plan is to get another studio to chip in. The good news is they’ve already got a director attached in Dean Parisot, the guy who did Galaxy Quest. Plus Alex Winter, the guy who played Bill, is onboard. OK, let’s see … anyone else still need to be accounted for? Oh, right, sorry: Keanu Reeves is down as well! Unbelievable. As far as obsessively monitored Internet fever-dream cult projects go, a third Bill & Ted ranks somewhere along the lines of another Ghostbusters and the return of Arrested Development. Considering the first and third things mentioned in that previous sentence are now actually happening, we really do need to recalibrate our expectations when it comes to totally unrealistic-sounding rumors. There are obviously all kinds of hurdles left to jump before this movie becomes a reality. But between a script, a director, and the commitment of its two stars — one of whom is still a big-deal Hollywood type — we are allowed to be optimistic. And can we give it up to Keanu right now? Dude should get a free pass forever for becoming an A-lister, bearing the burden of years of mockery while churning out straight classics over and over (just caught Speed on cable via my parents’ premium cable package while home for the weekend — totally still holds up! ), and then having enough of a sense of humor to go back and reprise the very character that birthed the whole “whoa” Keanu caricature. It is at this point I must confess something: As I shamefully admitted to Hollywood Prospectus editor Mark Lisanti no more than a few hours ago, I’ve never seen Bill & Ted 1 nor Bill & Ted 2. I didn’t do it on purpose! They must have just never come on at the right time back when I used to watch endless hours of cable movies via my aforementioned parents’ largesse. I will make no other excuses. I know I have to remedy the situation.